The No. 4-ranked University of Colorado women’s hockey team (17-5) split a two-game series with Midland University (12-15-2) this weekend at the CU Rec Center, with each team shutting out the other. The Buffs began the two-game set with a 1-0 shutout victory of Midland on Friday evening. Forward Morgan Mciver tallied her third goal of the season during the second period to break the scoreless tie. It was the only goal necessary for the Buffs to beat the visiting Lady Warriors. Junior goaltender Natalie Warnes stopped all 14 shots she faced to earn her fourth shutout of the season. Colorado looked to carry the momentum into Saturday afternoon’s Groundhog Day matinee matchup. The Midland’s competition proved enough to cool down Colorado’s hot streak on home ice, where the Buffs are tied for the second-most home wins in the American Collegiate Hockey Association’s (ACHA) women’s Division I class. The Buffs ultimately fell to the Lady Warriors 2-0 in a tightly-contested matchup. It was the first game that the Buffaloes were held scoreless all season long. Despite Warnes’ shutout the night before, with such a quick turnaround from Friday night’s game to Saturday afternoon’s, coach Ashley Rebeck opted to give her the day off. Sophomore goaltender Lexi Hartmann made the start in net for Colorado Saturday afternoon, stopping 28-of-29 shots in the loss. The contest began just as Friday night’s had ended, with the two teams exchanging chances throughout the game but unable to solve the defense of the opposing team. A penalty by Midland University eight minutes in gave Colorado an opportunity to take the lead, but the Buffs were unable to cash in on the advantage, similar to the game on Friday. Colorado earned six power-play opportunities but were only able to pot one goal during Friday night’s contest. Saturday afternoon, it was much of the same. The Buffs ended the series having converted just 1-of-12 power-play chances. The Buffaloes were missing quite a few players this weekend due to illness or injury, something a few of the players cited as a reason for the poor power play performance. Nefs mirrored the sentiment from her fellow teammate. “We have a lot of players out sick and it was a rough week of practice. Our power play wasn’t that great. We need to settle down more and take our time and we need to practice more.” she said. The Lady Warriors drew first blood 12 minutes into the first period when Midland’s Tieryn Arens stuffed one in tight on Hartmann. It was Arens’ 17th goal on the season. Down by one, the Buffs spent the better part of the final six minutes of the first period in Midland’s zone but were unable to find the back of the net, despite the flurry of shots on Midland’s goaltender, McKenna Gehner, who allowed only one goal on 29 shots the night before and stopped all 26 shots she faced Saturday afternoon. The first frame came to an end with the Lady Warriors holding a 1-0 lead. The score would remain that way until an empty-net goal with seven seconds left in the game. The second period began how the first ended for Colorado. The Buffs provided plenty of sustained pressure in Midland’s zone, until CU coughed up the puck at the blueline, providing a breakaway going the other way for Midland. Nefs chased the Lady Warrior down but tripped her up in the process, giving Midland their first power-play opportunity of the game. Colorado killed the penalty with relative ease, however. The Buffs’ penalty kill unit was one of the few bright spots this weekend, with the team finishing a perfect 7-of-7 between both games. After a few minutes of back-and-forth play, the Buffaloes earned their fourth of six power-play advantages of the game with four minutes left in the second period. Ash took the puck end-to-end, hitting the crossbar in what was the Buffs’ best chance of the entire game. The bad luck was much of the same for the Buffs in the third period, as both teams swapped chance after chance. With nothing going for Colorado and the team still down by one, in a last-ditch effort, Rebeck pulled Hartmann with less than a minute left in the final frame. Though the Buffs had the extra attacker on the ice, the team was still unable to beat Midland’s goalie. The Lady Warriors put the Buffs on ice when they shot the puck in Colorado’s empty net with seconds remaining to finish the game 2-0. 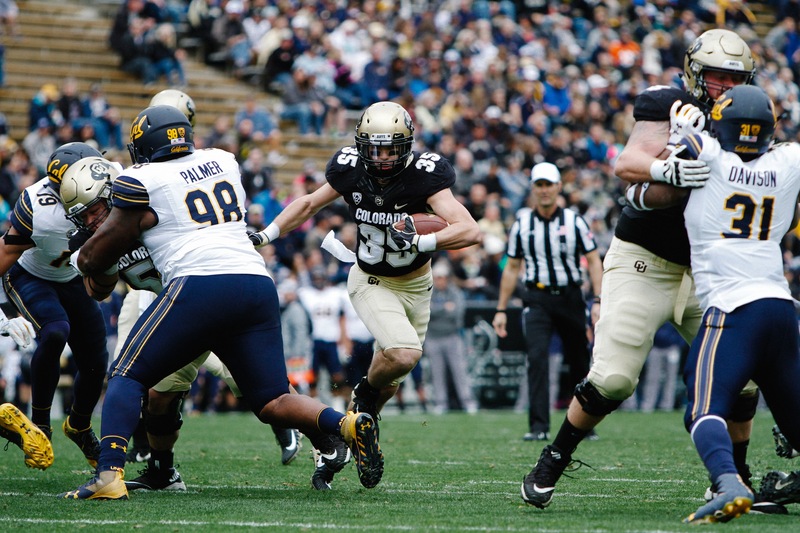 It was only the Buffs’ fifth loss of the season. Saturday’s contest was the penultimate home game of the 2019 season for Colorado, which will now go on the road for a two-game set against the University of Minnesota next weekend. The Buffs will return home and play their final game of the regular season at The Rec on Feb. 16 against intrastate rival University of Denver.